I had never been to Maine before. I expected gorgeous scenery, walks in the woods, and delicious seafood in Freeport. I didn’t know by the end of my trip I’d be dreaming of someday moving to a town like this on the East Coast. Here are some tips to make the most of a weekend escape to the lovely town of Freeport, Maine. When Hilton Garden Inn invited me and a guest to Freeport for a weekend, I wasn’t sure who to bring. Lacking in childcare, a romantic getaway with my husband wasn’t possible. For a two-night vacation, it was not practical to bring one of my kids at their respective ages of five and two for such long coast-to-coast travel from our home in California. 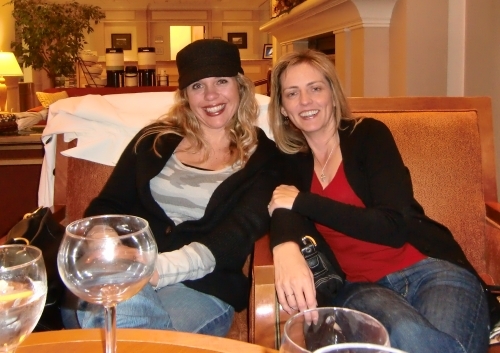 Erin and I met nearly 20 years ago. We share a birthday separated by one year. My second child and her first baby had the same due date. We were roommates during college and spent weeks backpacking through Europe together one summer. Now she and I see each other about twice a year, when she accompanies her husband to an annual conference in San Diego and when I return home to the Phoenix area every Thanksgiving. Erin and I landed in Portland after sleepless red-eye flights on a rainy, gusty day. When my umbrella flipped inside out and my travel neck pillow flew across the parking lot, Erin broke into hysterics. I knew then it was going to be a good weekend, no matter the rain or lack of sleep. 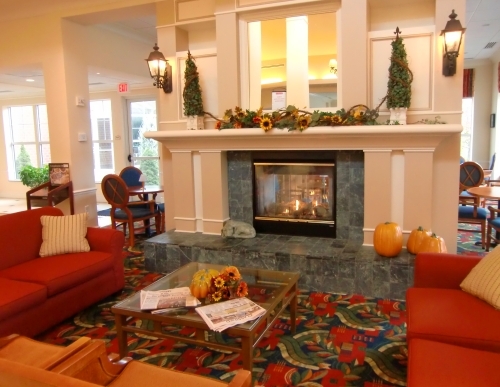 The Hilton Garden Inn Freeport is about a half-hour drive from the airport in Portland. This hotel was named the #1 mid-scale full service hotel for eight of the past nine years by J.D. Power & Associates. I can see why. The lobby with a fire burning in a central hearth surrounded by cozy chairs was a welcome reprieve from the howling “Nor-Easter” winds. In the evenings, guests flock here for drinks from the bar and lively conversations. The hotel’s indoor pool and hot tub beckoned but Erin didn’t bring a swimsuit. TRAVEL MAMA TIP: Always, always, always bring a swimsuit! It takes up almost no space in your luggage and you never know when it might come in handy! This Hilton Garden Inn has the welcoming feel of a country bed & breakfast, but with the amenities and privacy of a larger hotel. 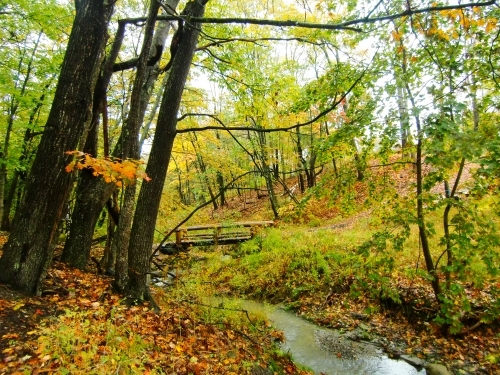 It is centrally located, making it easy to walk to Freeport’s darling downtown. We were there long before check-in so we lingered over our breakfast of made-to-order omelets and scrumptious cinnamon rolls in the onsite café. We downed a carafe of coffee each. Sufficiently caffeinated, we decided to brave the blustery, wet conditions outside. Sort-of. We asked the front desk to call a cab to drive us two blocks so we could go shopping. Freeport draws visitors from nearby and faraway for its quaint, walk-able downtown and its surplus of outlet stores and unique boutiques. Outlet shopping options include Coach Factory, Gymboree, Banana Republic, and oh so much more! We spent oodles of time exploring the town’s centerpiece, L.L. Bean’s Flagship Store. This massive complex full of comfy clothes and outdoorsy supplies could keep any shopper or warmth-seeking tourist happy and entertained for hours. Another day, we couldn’t decide between two local farms that offer nature trails, so we asked the gal at the Hilton Garden Inn front desk which was prettier. We were not disappointed with our choice to visit Wolfe’s Neck Farm per her suggestion. Find out why our visit brought tears to my eyes in this post about the Fall Festival at Wolfe’s Neck Farm. The other choice, Pineland Farms in nearby New Gloucester sounds just as appealing with its public garden, pond stocked for fishing and maintained for ice-skating in the winter, horseback riding, tours of their creamery, and onsite café. You can experience the outdoors in and around Freeport by kayaking, fly-fishing, canoeing, and camping in warmer months plus snowshoeing or cross-country skiing in the winter. L.L. 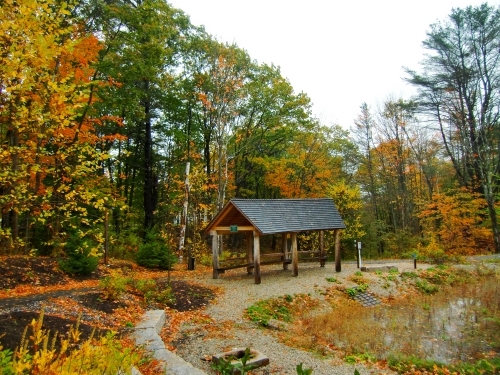 Bean offers numerous classes and tours for adventures like these through their Outdoor Discovery Schools. We became pretty well-acquainted with our cab driver, Dan, during our short stay. He owns AB Cab Company, the only taxi in town. It’s open 24 hours a day, seven days a week and Dan only recently hired two more drivers to help him out. He said he loves driving around town meeting folks like us so much, it doesn’t feel like work to him. One night when our dinner seemed to take too long, Dan had started to drive back to our restaurant to check on us before we had a chance to call him for our return trip to the hotel. He wanted to be sure we got back safe and sound. He was a wonderful resource for where to eat, shop, and play during our visit. A getaway to Freeport provides the perfect opportunity to connect with nature and with your travel mate, whether vacationing with your honey, your children, or a close friend. During our weekend away, Erin and I stayed up late chatting over glasses of wine, slept in late (a glorious indulgence for parents with little kids! ), ate lots of yummy food, and hiked through the woods. And we talked. A lot. Erin and I don’t talk on the phone much. As busy moms, phone calls don’t seem to make it into the schedule. When we do talk, it’s hard to make it past the standard stuff. How is potty training coming along? How’s your volunteer work going? Have you decided on a preschool? With some friends, after catching up on the kids, the husbands, and the latest gossip – the conversation runs dry. You start wracking your brain for topics yet uncovered. With good friends, after the initial chitchat is over, that’s when the really good talks start. That’s when you open up about the stuff that hurts, the stuff that makes your heart soar, the stuff you don’t tell most people. That’s how it was this weekend. Maybe it was the company or the break from the fun, but chaotic duties of parenting that have me daydreaming about my trip to Freeport. But something about this experience has gotten a hold of me. I love my Southern California life, but I now find myself longing to live in a place with distinct seasons, where hiking trails are stumbled upon, and where the beauty of nature is ever-present. Who would you take with you on a weekend getaway in Freeport Maine? Let us know in the comments below! A note from The Travel Mama: Thank you to The Hilton Garden Inn Freeport for my weekend getaway to Maine and this giveaway. What a nice trip to have with your girlfriend! And the scene looks so gorgeous. 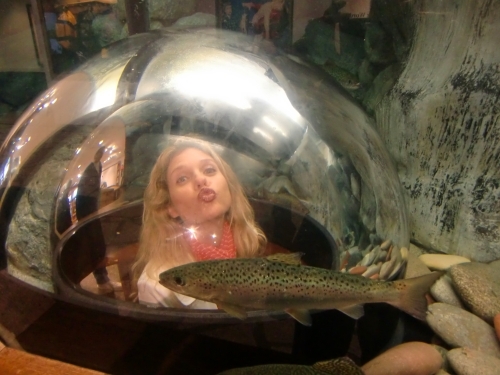 We got that same shot of my daughter in the fish tank bubble this summer when we were there! And of course, one of my son getting “stepped on” by the giant boot out front! Did you know the world’s largest rotating globe is only 10 minutes south of there, in Yarmouth? Wow, what a wonderful recap of our special trip! I feel like I am reading a travel diary, except I didn’t write it! Thank you so much for taking me on this special trip and thanks to Phil for suggesting me. : ) I will never forget it…it was a blast and I am still talking about it!!! It was fun to be a travel mama! Amy – I hope you can squeeze Freeport into your travel itinerary. You won’t be disappointed! Erin – Thank you for accompanying me to Freeport. I’m so glad this weekend gave us a chance to spend so much time together. It was as though no time had passed since college! I love this post! I love that you loved New England! (I’m from NH, and go back every summer w/ my kids.) What an awesome girls’ getaway. Thanks, Kara! I’ll have to make it to New Hampshire someday. There’s so much of the East Coast I have yet to explore.